What happens when the site of the world's worst nuclear accident is left all but abandoned for nearly 30 years? In the case of Chernobyl, it becomes a unique chance to see how wildlife recovers in what is a giant nature reserve, bereft of humans but tainted by radiation. "When the people left, nature returned," Denys Vyshnevskiy, a biologist in Chernobyl's so-called exclusion zone, told AFP during a visit, while nearby a herd of wild horses nosed around for food. Some may wonder how the northern edge of the former Soviet nation, where a part of the station exploded on April 26, 1986, spewing toxic clouds that reached from Sweden to Greece, could host any life forms at all. About 30 courageous and atrociously under-protected rescuers died in the weeks it took to control the fourth reactor's meltdown and a 2,800-square-kilometre-wide (1,100-square-mile-wide) exclusion zone was set up. The World Health Organization estimated in 2005 that 4,000 people could eventually die from radiation-related illnesses, a figure that Greenpeace slammed as a gross underestimate. The region and its 300 or so mostly elderly inhabitants remains far from safe, with radiation readings within 10 kilometres of the plant reaching 1,700 nanosieverts per hour -- 10 to 35 times the normal background levels observed in the United States. Today's animals in the exclusion may have shorter lifespans and produce fewer offspring, but their numbers and varieties are growing at rates unseen since long before the Soviet Union's 1991 collapse, says Vyshnevskiy. "Radiation is always here and it has its negative impact," said Vyshnevskiy. "But it is not as significant as the absence of human intervention." About 130,000 people were rushed from the region in the disaster's wake, with signs of former existence like children's sandpits and swings still standing and collecting snow in the winter, as if frozen in time. With the quick death of the local Red Forest -- 10 square kilometres of pines that wilted from the radiation that permeated the ground -- various birds, rodents and insects were lost. Over time, the forest was cut down and a new, healthy one sprung up in its place. The exclusion zone was placed under military surveillance to keep away the homesick for their own safety, and while a few hundred pension-aged people slipped back in over the decades, curious things slowly began to emerge in nature. On the one hand, species dependent on human crops and waste products vanished: white storks, sparrows and pigeons fell silent and no longer filled the skies. Yet on the other, indigenous species that flourished in the lush flora long before the catastrophe, reappeared. These include elks, wolves, bears, lynxes, white-tailed eagles and many others. One of the more brazen experiments came in 1990, when a handful of endangered Dzungarian horses were brought in to see if they would take root. They did so with relish, and about a hundred of them now graze the untended fields. For Vyshnevskiy, the rebound is an "environmental renaissance". Other scientists, though, are more cautious. Tim Mousseau, a professor of biological sciences at the University of South Carolina at Columbia, heads a team that has been conducting long-term research into biodiversity at Chernobyl -- a mission that they are also carrying out in the zone around Fukushima in Japan. 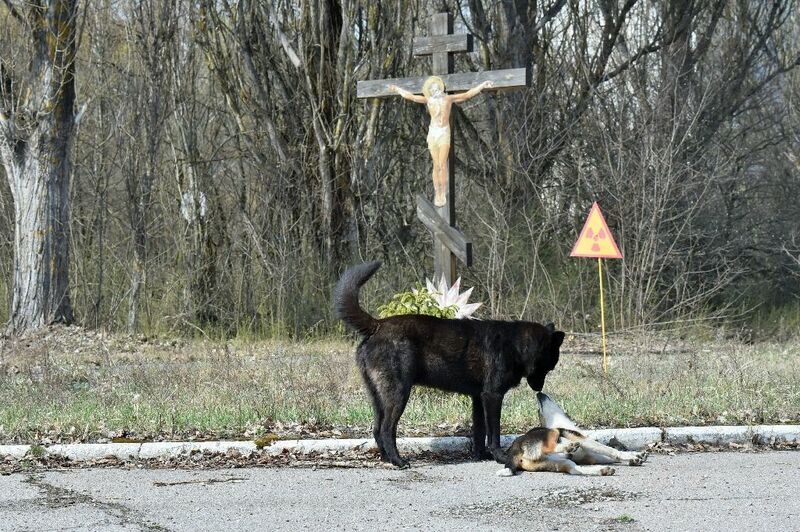 In a phone interview with AFP, Mousseau said that the range of species, the number of animals and their survivability in Chernobyl is less than what would be expected in a non-contaminated area -- especially in "hotspots" where radiation is high. Butterflies and birds in particular seem to have been affected most, apparently because of susceptibility on a key chromosome, he said. "When you put a fence around an area, it's clear that some animals will have an opportunity to expand, but because they are visible, it doesn't mean that they have increased as much as they should have, or that you have the biodiversity that you would normally have," Mousseau said. He added in an email: "Overall, in almost all cases, there is a clear signal of the negative effects of radiation on wild populations. Even the cuckoo's call is affected." Maryna Shkvyrya, a researcher at the Schmalhausen Institute of Zoology, Ukraine's oldest in the field, also urges prudence to those tempted to idealise the exclusion zone as a nature reserve. The zone is "unique... but not exactly a paradise for the animals nor an oasis", Shkvyrya said. "There are lots of people working on the power plant. There are tourists, stalkers and poachers." Vyshnevskiy says that the biodiversity benefits will rise with time. When the woods sprawl even wider across the empty fields, forest fauna and flora will multiply, he predicts. "There is a huge contrast between Chernobyl just before the catastrophe and Chernobyl 30 years after," said Vyshnevskiy. "These animals are probably the only positive outcome of the terrible catastrophe we had". 0 Response to "Chernobyl zone turns into testbed for Nature's rebound"